They came, they purred, they conquered. Yes, given the wild success of Manhattan's first pop-up cat cafe where people lined up for hours to snag some kitten cuddles, it was just a matter of time before somebody made one purr-manent. (Warning: This story was impossible to report without some requisite cat puns). 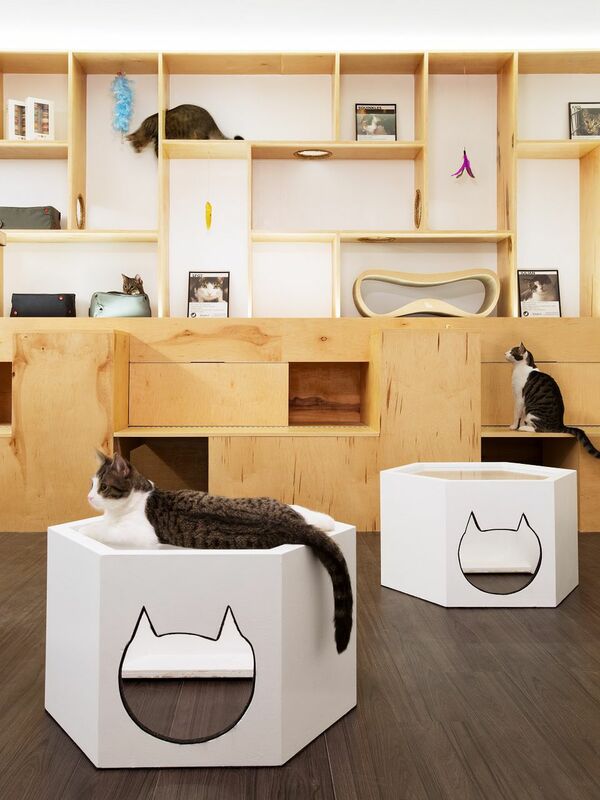 Part of a larger cat café craze that's been sweeping the nation (and an import from those trendsetting Japanese), the Meow Parlour debuted in December 2014 on the Lower East Side, where all cool cats in this city like to roam. The concept is simple: Unite cat lovers with cats in need of love, and hope to make some matches to find the kitties permanent homes. All cats are up for adoption, though, it's perfectly acceptable to come for some no-strings-attached snuggling (though, being cats, they're likely to prefer your company if there is indeed some string involved in your playtime together). In this city of small spaces, where landlords often frown upon pets, and demands of work and busy social lives can keep you away from home for long hours, this might be just the feline fix you're after. To visit, customers must sign up in advance, online—the kitty play and cuddle sessions at the Hester Street café start at $6 per 30 minutes. When you enter the café, you'll be asked to sign a waiver, slip off your shoes, grab a cat toy, and jump on into action: Up to a dozen rescue cats freely roam the space, lounging on the throw pillows and cat bed-lined shelves (you can also read up on posted photos and bios offering more details on the kitties' backgrounds). The entry fee includes free Wi-Fi access, too, should you want to show your new feline friends the latest trending cat videos on YouTube. The café accommodates a limited number of customers at a time (as not to overwhelm the cats), so reservations are essential. See ​their website for details on their hours and how to make a reservation. If you'd like to pair your cat-time with a coffee and a pastry, that's no problem. The café is the brainchild of cat lovers and pastry whizzes Christina Ha (co-owner of Macaron Parlour bakeries) and Emilie Legrand (one of the same bakery's first pastry chefs). They run the Meow Parlour Patisserie, just around the corner (which is how they were able to comply with city health regulations to offer food amongst felines), and encourage patrons to bring snacks and beverages back with them. You can even buy macaroons and jam cookies shaped like cat faces. Meow Parlour has partnered with local cat rescue and adoption group KittyKind, which keeps the café stocked with cats aplenty. All of the kitties are over four months old, have been neutered, and are up-to-date with their shots. If you do find the purr-fect match, you'll go through a quick background check with KittyKind, and be asked to a pay an adoption fee to help offset the agency's costs.